These are a lighter weight box that are good as a component part for a toy of your design or a foot toy. Easy to assemble with fold in ends. Other suggestions include putting clean pre-loved toy parts that still have good chewing left ... or add other wooden parts and/or porcupine balls, etc.! 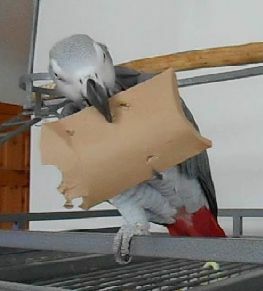 We put whole nuts inside, shredded paper, coconut fiber, ParroTraps, Just Fruit and/or Just Veggies, and tie the box closed (more foraging fun that way) with sisal, leather lacing or leather strips, paulie rope, or cotton rope for a big bird foot toy ... or string several of them together for even more foraging fun! The only limitations to what you can do with these boxes is your imagination! Go crazy ... your parrot will love you for it! Note: for conventionally shaped Kraft "boxes" click here! 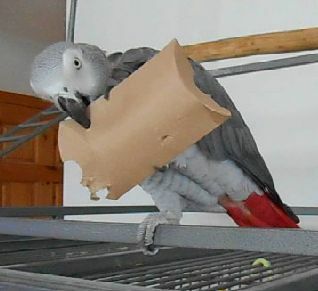 For sturdier corrugated boxes (for those mega beaks), click here!